At the basis of Love Meditation is: Love melts all blockages, love transforms all life.Dr. and Master Zhi Gang Sha has a long history of practicing and teaching the many disciplines of Traditional Chinese Medicine (TCM), including qigong, tai chi, kung fu, feng shui, and the I Ching. He also teaches the Love Meditation, which is a time for people to come together to embody love, share love and feel love. At the basis of Love Meditation is: Love melts all blockages, love transforms all life. During the Love Meditation, participants are guided into a deep state of relaxation. Participants focus on the energy and light that love brings into all our lives. This creates a powerful Field of Love that is very nourishing and healing. 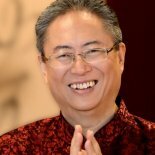 Master Sha joins Dr. Taz to explain how Love Meditation works, as well as the myriad benefits of TCM for mental, emotional, physical, and spiritual health.